Why are we so dissatisfied with our work? You’ve heard about it in the halls. Around the water cooler. At parties. When you pick up your son or granddaughter. No matter where you go, at least one person is complaining about their job. But it’s still surprising to see the statistics around work. The Conference Boardrecently published results regarding their latest survey on job satisfaction. They found that 51% of employees feel overall satisfaction with their jobs. Although this is actually an upward-trending number, the fact that 49% of workers remain unsatisfied is concerning, to say the least. In addition, workers noted disappointment in regard to the professional development aspects of their job. Meaning they gave the lowest marks to educational/job training programs. Other low categories include workload, the performance review process, and promotion policy. But what else goes into hating a job? And what can you do about it? Think of this as the “work just to get a paycheck” mentality. At a base level, many people only work to afford living expenses, pay student loans, enjoy hobbies, and fund college for kids. The majority often end up working for other reasons (parents’ expectations, to get married, to support children, etc.). You might have dreams outside of your current company, but can’t risk pursuing those dreams because of monetary obligations. So, sometimes you sit at the same job, day after day, working on autopilot, just waiting for retirement. The only way to get around this is to break free of constraints. If you truly hate your job, you should quit. But the future is scary. As a solution, consider working other jobs part-time, and think of it as a trial run. And if you just plain hate the industry you’re working in? Seek out online classes or night school to learn a new trade. Your cubicle mate chews loudly, every day. Amanda in Sales is jealous of your promotion. Your boss refuses to let you advance because he needs you to keep reporting to him. You just can’t get past that glass ceiling. 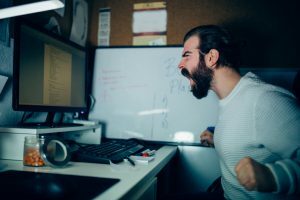 Office drama comes in many shapes and forms, from annoying coworker habits to illegal activity at the top of the food chain. No matter the severity of the drama, it can easily affect your work satisfaction. For smaller issues, try contacting managers to discuss options. Or if you have a horrible boss, you can ask to move departments (just make sure to document all abusive behavior). But for problems up at the top? It might be time to leave. To ensure that you don’t end up encountering another unstable company culture, check out Glassdoor, a site where employees can review companies. That way you’ll have a better idea of what you’re in for. This is a big one. Earlier we mentioned that, at a base level, most of us work to get a paycheck. If you’re working more than what your paycheck is worth, you’re going to be unhappy. You see other people get promotions or raises and just grow even more unsatisfied with your job. You work harder than them—why haven’t you gotten a raise? In many cases, this is because you haven’t asked for one. Asking is tough; we get that. That’s why we’ve provided the tools you need to negotiate a raise. And if they won’t pay what you’re worth? Start looking elsewhere. The job search can be intimidating, but what have you got to lose? In a worst case scenario, you’ll keep working where you are. But you deserve the chance to find something better.